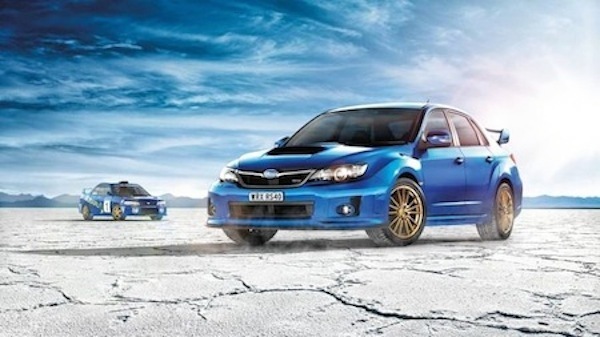 Subaru Australia is launching a limited-run special edition 2013 WRX RS40 sedan to commemorate the 40th anniversary in Australia. It’s been 20 years since the original turbocharged “pocket rocket” WRX went on sale in Japan and it’s been a big success around the globe. This will be the very last current generation WRX special edition model. We knew it was going to be launched but now we have details on the 20th anniversary limited edition WRX. The special edition RS40 adds more than $7000 worth of features that pay tribute to Subaru’s motorsport heritage. Outside, the RS40 gets gold colored 17-inch alloy wheels, STI front and rear spoilers, and WR RS40 decals. Under the hood there will also be an STI flexible tower strut brace. Inside it comes with a STI short shift gear assembly, Recaro seats with blue colored Alcantara inserts and numbered RS40 internal badge. Subaru also recently launched the 2014 BRZ S in Australia that features a range of Subaru Tecnica International (STI)-inspired equipment. The factory-backed pack comprises a long list of components that distinguish it from the standard BRZ. The BRZ S will be track ready and will include front under, side, rear-side and boot lip spoilers, a flexible tower bar, coil spring set and 17-inch black STI alloy wheels. The WRX RS40 is available for pre-order now and will be in showrooms at the end of August. It will be priced at $44,990 (Aus) and will come with a 2.5-liter turbocharged engine and a five-speed manual gearbox. The exclusive special edition 2013 WRX RS40 will be in high demand and will likely sell out quickly.